Last week I wrote about pervasive English in Chilean Spanish. Here are a few more comical examples. On the road from my apartment to the parish church there is a payphone. 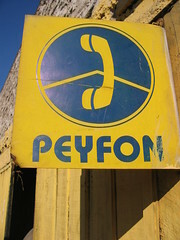 It is labeled “Peyfon,” which is pronounced “payphone” in Spanish. 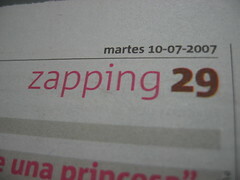 “Zapping” is the name of this newspaper’s TV listings section. The word zapping has been appropriated by Chilean Spanish to mean channel surfing. Hacer zapping = to channel surf. 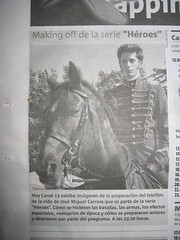 A program that details the making of something is a “making off.” This page from the same Zapping guide informs the reader that the Making Off of the Heroes series is soon. This isn’t an isolated incident either. A quick Google search shows there are marketing companies that specialize in “making offs” and plenty of “making offs” different movies. Te cagaste: they say “zapping” in Spain, too. Zapping. That’s a good one. It makes channel surfing sound active and exciting. I think I’ll start using ‘zapping’ in my vocabulary in general. ex: I’ll just zap into the kitchen and make myself a latte now.